T'Gallant connotes the peak, the best, the epitome. T'Gallant's winemaking philosophy is the same. Their range of wines exude a vibrant, eccentric personality and an impeccable sense of style. Built on a tradition of exceptional Pinot varieties - Grigio, Gris and Noir - T'Gallant wines support a vision for the creation of great Australian Pinot. 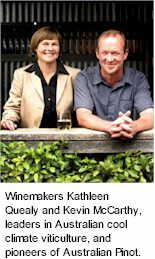 T'Gallant was founded by winemakers Kathleen Quealy and Kevin McCarthy who are leaders in Australian cool climate viticulture and winemaking and pioneers of Australian Pinot Grigio and Pinot Gris.The philosophy of Kevin and Kathleen dramatically evolved when they arrived on the Mornington Peninsula in the late 80s. They directed their focus on viticulture, knowing this was the key to making the greatest wine. T'Gallant have contracted out many vignerons to grow Pinot Gris on the Mornington Peninsula, and have provided the management company that would harmoniously produce the superior vintages they desired. Today, their Mornington Peninsula Pinot Noirs are understated and sensual, relying on excellence in both the vineyard and the winery. T'Gallant Cellar Door, La Baracca Trattoria, tasting and educational area, ensure an enchanting winery and tourism experience. They are sited around the original apple cool store, a rustic, ambient area for visitors. The T'Gallant winemaking style is expressive. Natural warm fermentations ensure gossamer-like yeast aromas. Each wine is assessed regularly on its journey to the bottle. Reductive characters are blown off with air. Gentle fining when required uses natural proteins and egg white. Blends of vineyards occur after fermentation, however the ultimate destiny of a vineyard's fruit may have been determined many years before. T'Gallant's diverse range of premium wines and imaginative packaging to match, is showcased on their wall of wine. T'Gallant crafts wines inspired by the cool, maritime climate that ripens grapes to beautiful, intense flavours. There is an authenticity to T'Gallant which has made it one of Australia's most respected producers. Kathleen and Kevin's fearless attitude and individualism ensures they will always stand out from the crowd.